There has been an exciting discovery at Tapichalaca, a reserve in south east Ecuador owned and managed by Fundación Jocotoco (FJ) and supported by World Land Trust (WLT). Juan Carlos Crespo, Reserves Director, and Byron Puglla, Administrator of Tapichalaca, sent us this report. We are pleased to share some very good news relating to species monitoring in Tapichalaca Reserve. Recent images of a Stump-tailed Porcupine (Echinoprocta rufescens) are highly significant. This is the first recording of the mammal not only for the Tapichalaca Reserve but also for the province of Zamora-Chinchipe. According to the literature, this species is distributed in the western cordillera, central and eastern Andes of Colombia (Woods and Kilpatrick, 2005) and in the eastern foothills of the Ecuadorian Andes (Delgado and Tirira, 2008). 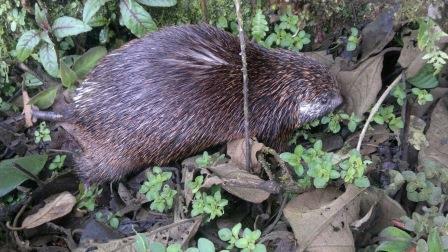 In Ecuador this species of porcupine is distributed in the Eastern Cordillera between the provinces of Carchi, Tunguragua, at altitudes from 1,200 to 3,414 metres above sea level, and in the Western Cordillera in Yunguilla Valley (Azuay province) (Tirira, 2007). According to another source (Narváez Romero, et al, 2012), it is also distributed in the western part of Ecuador, in the provinces of El Oro and Loja, so in the south east of Ecuador this would be the first recording. The photos of the porcupine were taken by Byron Puglla. The Stump-tailed Porcupine is the only species in the Echinoprocta genus in the new world family. It is a relatively small porcupine with a short tail. It is a good climber and spends much of its time in trees. 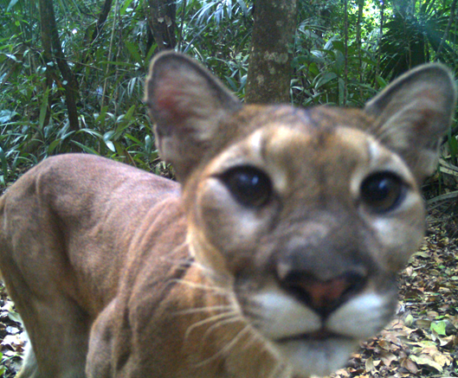 There is more good news regarding our camera-traps. 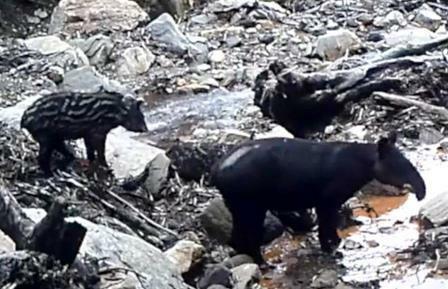 They have only been in place for a couple of months and already they are revealing images of rare creatures. So far, the camera-traps have recorded two species of mammals and one bird: Oncilla (Leopardus tigrinus) listed as Endangered by IUCN, Mountain Paca (Cuniculus taczanowskii), listed as Near Threatened, and Highland Tinamou (Nothocercus bonapartei). The camera-traps are enabling us to register different species of mammals and birds and it is clear that they have an important role to play in supporting our protection efforts in the reserve. Furthermore the presence of different species indicates that Tapichalaca remains an excellent habitat for rare and threatened creatures. WLT will be launching an International Trail Camera Competition with The Times in the next few weeks. There will be more information about the competition on WLT’s website in due course. You can support FJ’s conservation efforts in Ecuador by donating to WLT’s Keepers of the Wild appeal.